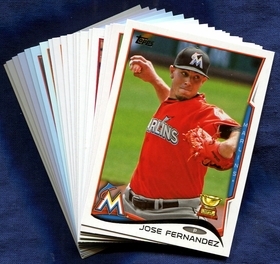 The 2014 Topps Miami Marlins baseball card Team Set contains 20 Miami Marlins baseball cards including Star Players like Giancarlo Stanton, Christian Yelich, Jose Fernandez, Jacob Turner and the rookie cards of Steve Ames and Jake Marisnick. GO Marlins !! Baseball card collecting as a hobby has always been well suited to baseball fans young and old alike plus collecting baseball cards of your favorite MLB baseball team is a fun way for you to keep track of your teams players and show off your home team pride all at the same time. Baseball cards are an item you can treasue for a lifetime along with the memories of collecting them with friends and family. 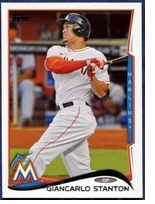 Topps Baseball cards have been collected longer than any other brand on the market today and card collecting is a great family activity that builds long lasting memories. All cards in this team set are listed below.